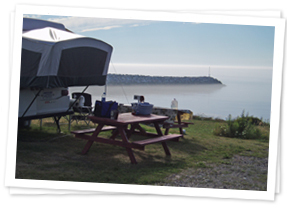 Located directly on the beautiful Bay of Fundy in Nova Scotia, this is Nova Scotia's only Four Star oceanfront campground. Whether you travel with a tent, trailer, RV or Big Rig, this scenic location is enhanced by the wharf, fishing fleet and fresh seafood market next door - creating an an ideal spot for your camping vacation. Guests of the Cove Oceanfront Campground enjoy more than one-quarter mile of unspoiled shoreline directly on the Bay of Fundy, as well as fresh salt air, spectacular sunsets and an idyllic marine environment. The seaside settlement of Parker's Cove is a short drive (five miles/eight kilometers) outside the historic town of Annapolis Royal, and area activities include shops, galleries, restaurants, an 18 hole golf course, two National Historic sites and the award winning Historic Gardens. An easy drive brings guests to the Parks at Upper Clements, Digby, the St. John ferry to New Brunswick, Kejimkujik National Park and whale watching on the Bay of Fundy. This sparkling clean, quiet, safe and secure resort campground has no seasonal or permanent guests, and provides separate areas for tents and RVs. The park welcomes travelers seeking serene oceanfront tent sites, Water View and Waterfront RV sites and spacious Big Rig sites. Enjoy your stay by taking a swim in the heated pool, beach-combing on the Bay of Fundy shore, or feasting on fresh lobster or scallops. Celebrate the end of the day with a crackling campfire, the sun sinking into the ocean in a blaze of color and a dark night sky filled with stars. Many guests find that this comfortable and convenient location provides an ideal base camp for exploring south-western Nova Scotia. With no shortage of things to see and do in the area, everything you need to plan your vacation - Rates, Special Values and a secure on-line Reservation Form - is available at your convenience. Reserve your vacation spot today!